VO The World’s Languages CM 7/2 h/5 ECTS-Credits). 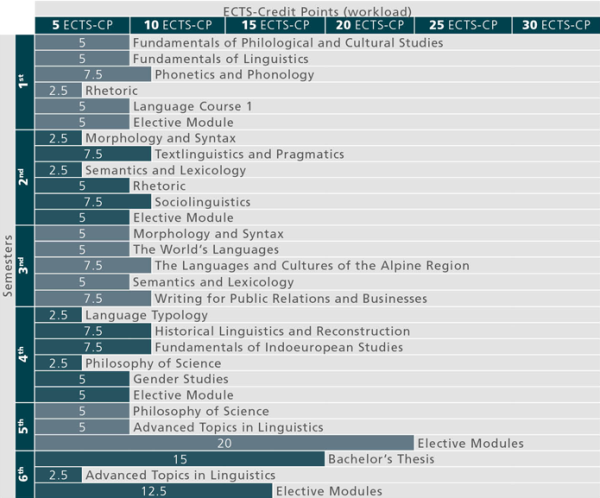 Graduates of the Bachelor's Programme Linguistics are able to carry out linguistic analyses in different fields of application and to apply the acquired analytical competences in other disciplines and fields of activity. Theoretically sound analyses of linguistic facts and assessment of theoretical models both from a synchronic and a diachronic perspective; general overview of languages and their genetic, typological and areal classification. To be acquired in practice-oriented modules, e.g. patholinguistics and logopedics, writing for public relations and companies, rhetoric, sociolinguistics. Development of a general language learning competence, whereas the acquistion of typologically different languages is recommended. Familiarity in dealing with different text types and media, combined with the acquisition of a general presentation competence. Competence in cultural science with special attention to the languages and cultures of the Alpine region is to be conveyed. Cultural interaction processes are to be analysed and developed. Moreover, the development of interdisciplinary key competences is to be emphasized, such as independence and orientation competence by autonomous knowledge acquistion and further education, verbal and written expression, foreign language competence as well as teamwork and gender competence. Graduates are able to implement profound language analysis in different application areas and to apply analytical comptences in interdisciplinary contexts. They possess scientifically well-founded theoretical and methodical problem-solving skills, orientation competence with individual and critical knowledge acquistion, verbal and written expression, teamwork and gender competence. Graduates of the Bachelor's Programme Linguistics have acquired the scientific basis for a relevant maste's programme. The programme prepares for the following activities: publishing, librarianship and documentation, media and communication, advertising agencies, language consulting, health care (language assistance, language therapy), sign language institutions, technical documentation.